Hooray! – our limited edition T for this years Supersonic has just arrived at festival HQ, created by artist Justin Bartlett – available exclusively at the festival 1/100 on Fly 53 T’s. Justin previously created an illustration for our Supersonic 08 exhibition entitled ‘Creatures Of The Night’, we liked his work so much we invited him back. 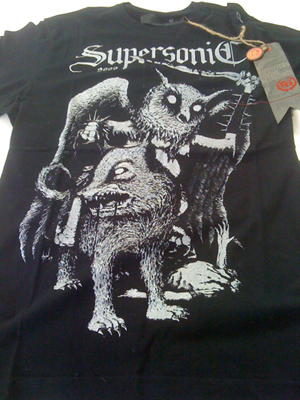 This year he has conjured up an illustration for our limited edition Supersonic Festival T-shirt, he’s done us proud with this astonishing design – get one while you can only 100 produced. Previous artists in the Supersonic series have included Gunsho, French & Stephen O’Malley.